If you haven't yet visited Jan's Dusty Digitals blog, you're missing out. Jan shares templates & ideas to help you get those photos out of the boxes & onto a page so they can be shared with everyone. You will want to download all her templates & try some of her excellent tips. Great job my friend! 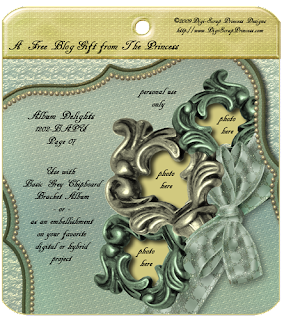 Thanks for sharing with the digi-scrap community. Scroll down to the "Blogs I Frequent" category here on my blog & click the link for Dusty Digitals. 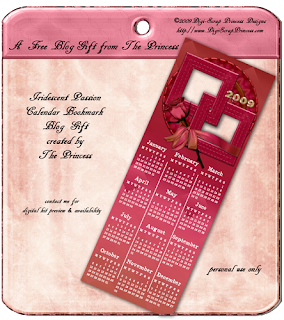 This bookmark calendar was created by me using my Iridescent Passion kit. 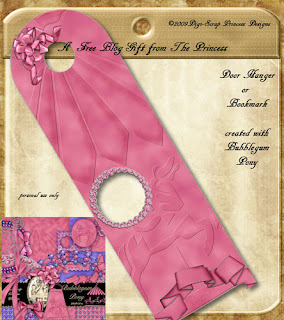 Click Here to Download Iridescent Passion Bookmark. Link will remain active for a limited time,so download ASAP so you don't miss out. While your'e at it, don't forget to download the Iridescent Passion QP by SallieK! My Creative Team is hard at work creating lovely gifts to share with you. A special thanks to my very talented CT member Sallie King for creating this beautiful QP using my Iridescent Passion. Click Here to Download Iridescent Passion QP by Sallie. Link will expire after 200 downloads or 14 days, whichever comes first, so hurry & download it while you can! The Bracket Album is for personal use only & fits the Basic Gray chipboard bracket albums. Use it on chipboard albums OR layer it on 12x12 digi-scrap layouts. Click here to download Album Delights BAPU-1202-Pg05 and Blank Page D. The link will remain active for a limited time, so hurry to download your free gift. Check back weekly to download the remaining album pages (including covers) & Accessories Pack. Diane created this lovely 5"x7" brag book page for you using my Charity kit. Thanks so much for sharing Diane! Click here to download the BBP. The link will remain active for a limited time, so please download ASAP so you don't miss it. Today is a very special day for me, because 21 years ago today I was diagnosed with an extremely rare life-threatening disease, Fibrosing Mediastinitis (aka Mediastinal Fibrosis). At the time of diagnosis, fewer than 300 people had ever been diagnosed with FM/MF. I will never forget the post-surgery conference when the surgeon said, "The bad news is you don't have cancer - if it was cancer there would be hope. With this disease there isn't any hope because everyone dies from it, usually in their 30's or 40's." Hello?? I was 36 & he was telling me I had no hope? That just doesn't work for me! At a follow-up meeting I asked the pulmonologist what I could do. His response, "Nita, go home & get your affairs in order." Although he was telling me I was going to die soon, when I asked for further information on the disease he said there had been very little written in medical journals & what he could find was written in "medicalese" that patients wouldn't understand, so he didn't think it was necessary for me to have it. What's a patient to do? Get a second opinion! Determined not to let one man dictate whether or not I would survive, I contacted the top ten medical centers in the U.S. asking for referrals. I was referred to the leading authority on the disease, James E. Loyd, Pulmonary & Critical Care Medicine, Vanderbilt University Medical Center, Nashville, TN. 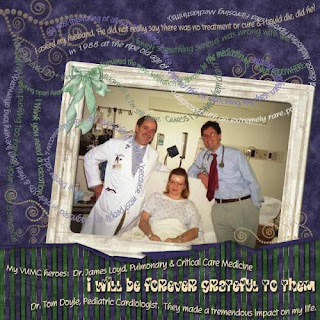 Jim gave me hope & told me that he had one patient who had battled the disease for 20+ years & was still doing well. Sure, others had lost the battle, but the majority of his patients were still breathing! Although there is currently no treatment for my disease, Jim confirmed my belief that as long as there is breath there is hope. "Nita’s story is one of courage and survival. I used excerpts from her full story in the layout. The strands of the story represent the fibres, and the hard to interpret, chaotic arrangement of them represents the disease itself." I don't know what the future holds, but I do know that I will not go out quietly. We all have something to survive, whether it is my friend & fellow-designer Nancy who has survived breast cancer, my Mother, a 28-yr. colon cancer survivor, or my friend who survived a near-fatal auto accident. Perhaps you aren't fighting a serious disease, but with the current economic status, you may be trying to survive cutbacks & layoffs. When faced with a crisis, it's OK to cry & want to give up. It happens to all of us. Allow yourself an occasional "woe-is-me" day, then shake off the despair & go back into survival mode. We may lose all our possessions, but after we get over grieving period, we realize they are only "things" & believe it or not, we can survive without them. Really we can! I know, because after 21 years of medical expenses, losing my IT career due to chronic illnesses & a failed marriage, I have nothing left. Nothing except the things that matter most - my dignity, family, friends & life. We sometimes feel that if we lose our careers, we lose our identity. NOT TRUE! When you face death, you won't care about your career or all the things you've collected during your lifetime. You are defined by what's inside & that's something that can't be bought. As long as there is breath, there is hope. None of us know what tomorrow holds for us, but there is always today. Live, love, be happy & don't forget to breathe! If you've been following my blog you've no doubt noticed that I uploaded two gifts today & one yesterday. I just can't stop myself!! It's soooo much fun to share my digi-gifts with you. A few years ago I rec'd. 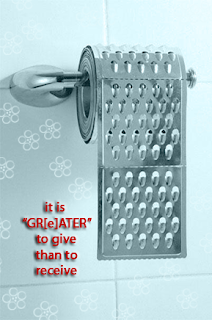 the GrAter TP roll via e-mail. I don't remember who it was from, so I can't give credit for the original image. I added the message & e-mailed it to my brother for Christmas that year. Life is what you make it & when it turns sour, no problem... make a loaf of sourdough bread, slather on the butter & enjoy every minute. Life's too short to sweat the small stuff. Have a beautiful day, if for no other reason, then do it because you're still BREATHING & God is with you every step of the way! Here's a simple little alpha I created long before I started designing digi-scrap kits. I hope you enjoy my Here's To Luck Alpha set. 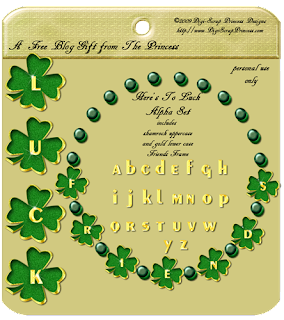 Set includes uppercase shamrock & lower case gold alpha set & a Friends Frame. Click here to download Here's To Luck Alpha. The link will expire after 200 downloads or 14 days, whichever comes first. Click here to download Album Delights BAPU-1202-Pg07. The link will remain active for 200 downloads, OR 14 days, whichever occurs first. Check back weekly to download the remaining album pages (including covers) & Accessories Pack. My Creative Team is hard at work creating lovely gifts to share with you. A special thanks to my very talented CT member Jan Ring for creating this beautiful Brag Book Page. Click Here to Download Another Spring BBP01 by Jan. Link will expire after 200 downloads or 14 days, whichever comes first, so hurry & download it while you can! This gift card & envelope were created using my Chocolate Elegance Collection. Quick & easy assembly instructions are included. 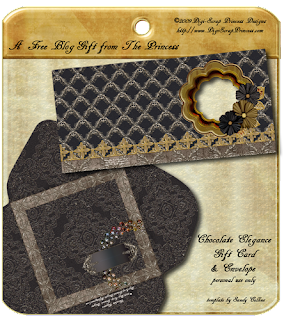 Click Here to Download Chocolate Elegance Gift Card & Envelope. Link will expire after 200 downloads or 14 days, whichever comes first. Click Here to Download BAPU-1202-Pg02. Link will expire after 200 downloads or 14 days, whichever comes first, so hurry & download now! I would love to see how you use this album page. Check back weekly to collect the entire FREE BAPU-1202 album. This page has plenty of room for embellishments or journaling. The Bracket Album is for personal use only & fits the Basic Gray chipboard bracket albums. 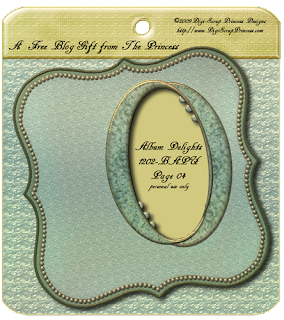 Use it on chipboard albums OR layer it with your favorite digiscrap project. Click Here to Download BAPU-1202-Pg04. Link will expire after 200 downloads or 14 days, whichever comes first, so hurry & download now! I would love to see how you use this album page. 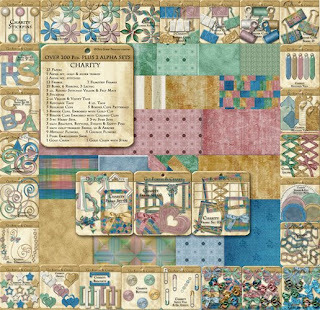 This bookmark was creating by me using my latest mega-kit, CHARITY (kit preview below). The mega-kit contains nearly 200 pieces PLUS two (2) alpha sets. Click Here to Download Charity Bookmark01NR. The link will expire after 200 downloads OR 14 days, whichever comes first, so act fast... you won't want to miss it! If you have links to my blog on your website / blog, please update your links accordingly. 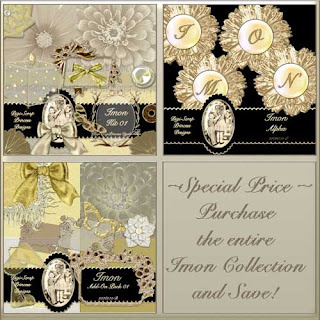 Today's FREE GIFT is a greeting card created with my Imon Collection. This beautiful greeting card was created by Grace. Thank you Grace! A preview of the Imon Collection is shown below. Click Here to Download the Greeting Card. Link will expire in 14 days or after 200 downloads, whichever comes first, so hurry & get it on your hard drive while you can! 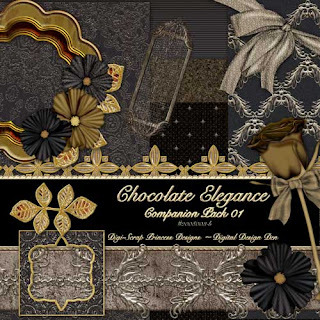 The 3 items in this Blog Gift Zip were created using one of my favorite kits - Chocolate Elegance Collection (previews of collection included in this poast). 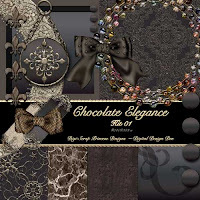 Click Here to Download the Chocolate Elegance Blog Gift. Link will expire after 14 days or 200 downloads, whichever occurs first, so hurry - you won't want to miss out on the freebies! I hope you enjoy this Bubblegum Pony Door Hanger / Bookmark. 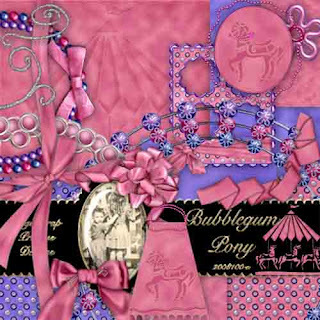 Created with my girly, whimsical kit Bubblegum Pony, with plenty of room to personalize! 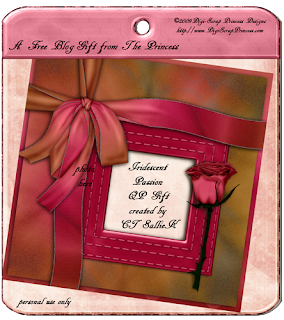 Click Here to Download the Blog Gift. The link will expire after 200 downloads or 14 days, whichever comes first.